The DMR-203 may be used with Pro-150 controllers. There are two ways of doing this. One involves a slight modification if the DMR but has simpler wiring. The second does not involve modifying the DMR, but has slightly more complicated wiring. We sell the DMR-213 version which is built to work with the Pro-150 as standard. To use with the standard wiring as shown in the DMR instructions for use with DNO, VTX, or Pro-120 controllers, the DMR needs a small modification: the 5v regulator in the DMR must be removed so it will operate from the 5v supplied by the Pro-150. This modification is easily done by anyone competent with a soldering iron. The regulator is identified in the drawing below, left. Remove it and link the outer two pins as indicated, right, with a piece of copper wire. We are happy to do this for you, please let us know prior to ordering. The Pro-150 will need to be reprogrammed suitably. Although the default program works, its unlikely to be what you need and the DMR will not give full speed with the default programming. If the DMR goes into Failsafe mode, it causes the Pro-150 relays to chatter. For Pro-150 with serial numbers number less than 750, the two 10K resistors will need to be reduced in value to ensure the reversing input is adequately pulled high. Change these resistors to 3K3. The reverse threshold voltage for the early Pro-150 to register reverse was about 17v. Serial numbers 750 and above have a reversing threshold of about 4.7v so these resistors do not need to be changed..
Pin D of the 6 way control connection (Connector C, Pro-150 instructions, page 5) is the pot top connection from the controller. On VTX and Pro-120 this feeds approximately 8v to the pot – or the DMR – and the DMR draws its power from here.The Pro-150 is a digital controller so the voltage here is only 5v. This does not give enough to operate the DMR properly, so an alternative supply must be used. 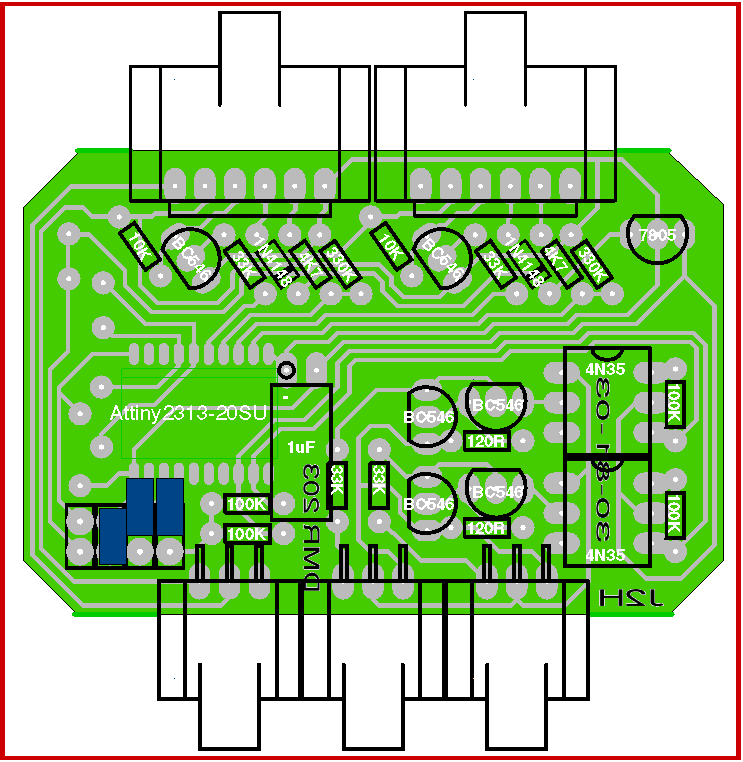 +12v may be easily brought out to pin A of the display connector (connector D, Pro-150 instructions, page 14) this pin is marked as ‘spare’ and is not connected internally. 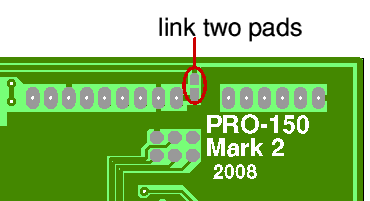 The diagram shows the corner of the board where the display and programming connectors are soldered: link the two marked pads with a solder-bridge. Caution: the 12v supply is not protected. If you draw too much current from this point the dropper transistors (on the same edge of the board) may get too hot and may fail. This could cause major damage. 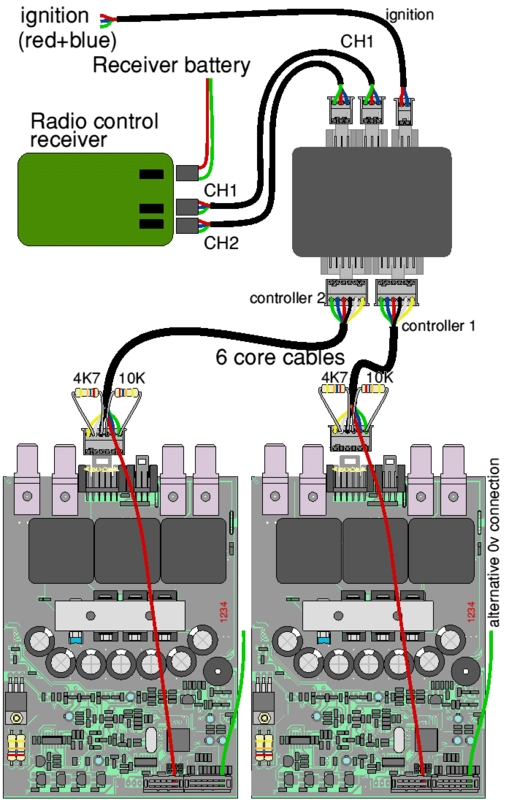 Wiring is then as shown in the diagram. Note the 10k resistors fitted in place of the pot track (between pins D and F) – without these, a pot fault will be detected (Pro-150 will report Pt). If it simplifies your wiring, 0v (green wire) may be connected to the auxiliary connector (connector A) pin A which is the main 0v. Beware that this connection is not protected by a fuse track, as is the normal connection on connector C.
Note also the the 4K7 resistors to pull up the reversing input to the Pro-150: with the current build of Pro-150 the voltage required on the reversing input is about 17v. The existing 10K pullup resistors in the DMR will not quite give this on a 24v battery. For 36v or 48v operation there is no problem. If preferred, the resistors in the DMR can be changed as shown in the diagram below. For use with Pro-150s on 24v, the 10K pull-up resistors need to be reduced to less than 4K7. A value of 3K3 is suggested. For 36v or 48v operation the existing 10K resistors are adequate. 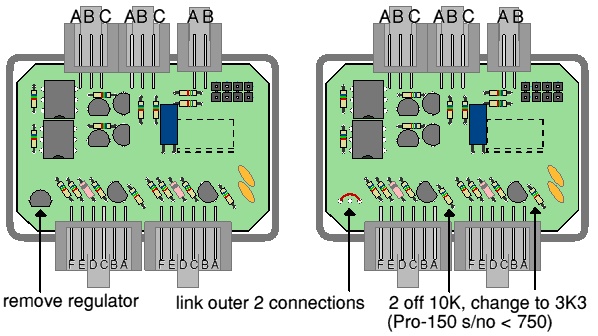 There are only two 10K resistors present: these can be seen in the diagram below the left edges of the two 6 way connectors (at the top of the board). We are happy to do this for you, please let us know prior to ordering. You will also need to reprogram the Pro-150s (pot zero and pot maximums, parameters 12, 13 and 14) as explained in the instruction manual for operation with the DMR. The standard programming works, but is unlikely to be what you require as the system is unlikely to reach full speed.